BRIGHTON, Mich. - Ford Motor Company has recently been testing a high-tech brake light that would warn drivers from afar. This early warning brake light would be able to alert drivers from around a bend, or even behind other vehicles. While it is still in the beginning stages, ideally this braking system would transmit a wireless signal to illuminate a light in the dashboard of the cars nearby. By illuminating this light, drivers would be aware of braking cars in front of their vehicle, or around a corner. This would be especially useful in busy highway situations, as people have the tendency to slam on their brakes without warning; this often causes collisions. 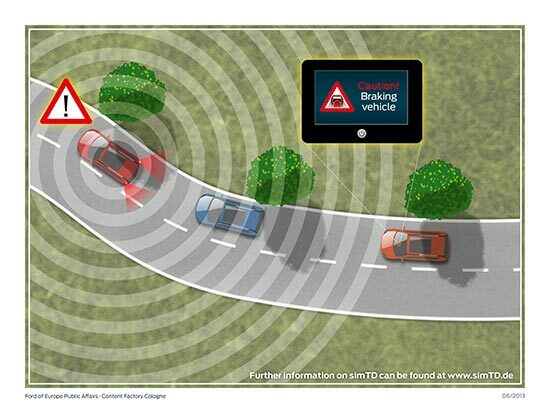 This braking system would give drivers one more tool to avoid an accident. This "Electronic Brake Light" that warns drivers from afar is only one of the 20 systems that Ford is testing for Safe Intelligent Mobility. These systems would all work to intelligently communicate car-to-car and help improve safety on the roads. Currently the Electronic Brake Light is being tested in 120 vehicles in Frankfurt, Germany. However, if the testing is successful, we should see this safety system integrated into Ford vehicles within the next couple years. Ford is constantly evolving to make sure that your ride is as safe and enjoyable as possible. If you'd like to see what safety features are currently available in our vehicles, stop by your South Lyon Area Ford Dealership and check out our large selection of Ford Cars For Sale or New Ford Trucks.